Death from rupturing aortic aneurysms is preventable, but early aneurysm detection is critical. An AAA can be discovered by a simple abdominal aortic aneurysm screening or ultrasound exam. This low cost outpatient scan is a highly accurate, painless and completely safe method for aneurysm detection. A technologist scans the abdomen with a small device that displays the aorta on a monitor. 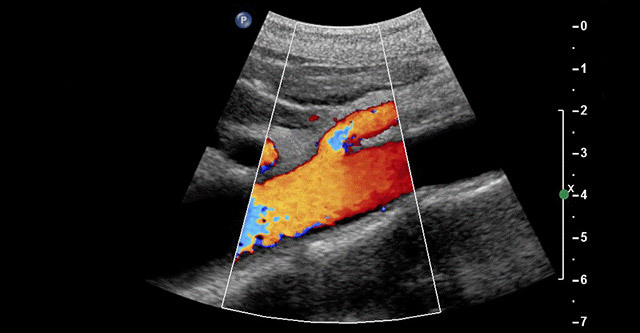 Ultrasound of an aneurysmal aorta, showing the bulging aneurysm. Red lines show the outlines of the aorta. Abdominal aortic aneurysm screening has been proven to lower the death rate in the at-risk population. In the British Multicenter Aneurysm Screening Trial, patients who underwent screening reduced their death rate from AAA by 50% over four years. 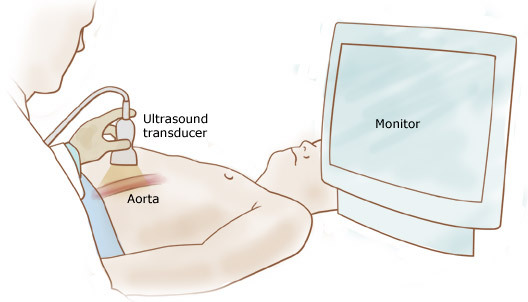 The cost of an abdominal aortic aneurysm screening with ultrasound is less than $100.00. As of January 1, 2007, Medicare is offering a free, one-time ultrasound screening benefit to qualified seniors. This is linked to its “Welcome to Medicare” Physical Exam Program. This screening benefit became the Screening Abdominal Aortic Aneurysm Very Efficiently (SAAAVE) Act, with support from bi-partisan lawmakers and the National Aneurysm Alliance. Men who have smoked 100 cigarettes in their life and women with a family history of AAA may qualify for this one time abdominal aortic aneurysm screening. The exam must be completed during the first six months of Medicare eligibility. Only your doctor can order this free screening exam. Screening for AAA in high risk individuals can save thousands of lives and millions of dollars. For information about AAA screening, call 708-245-7490. When an aneurysm is discovered, it may not be large enough to warrant immediate repair. The AAA patient will then go into asurveillance program, getting imaging follow up every six months to one year with ultrasound or CT scans. When the aneurysm enlarges to 5 cm (about 2 inches), the risk of rupture increases and repair is usually considered. Rapid increase in size of aneurysms less than 5cm (more than ½ cm growth over six months) is worrisome and may indicate repair. We participate in aneurysm detection and surveillance and can help you monitor your AAA with your doctor. Contact us for an aneurysm detection screening at our Chicago, Illinois clinic or call us directly at (630) 856-7460.